There are two ends to this journey of images. One is the frontline, where the troops are deployed—a tough, bleak place in reality, and a place of high, almost mythic aura in the public consciousness. As PM, Narendra Modi has often found himself there, donning military fatigues, seeking to blend himself with that air suffused with taut, vigilant power. 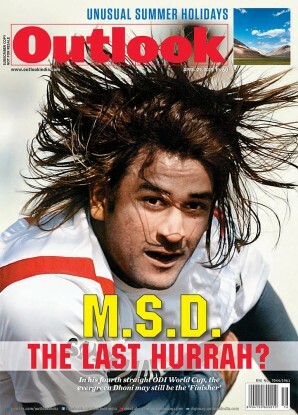 The other end is Indian society, where those ima­ges circulate. In Modi’s case, there is no better venue to judge this than his original home, his place of birth and the one that catapulted him to natio­nal consciousness. 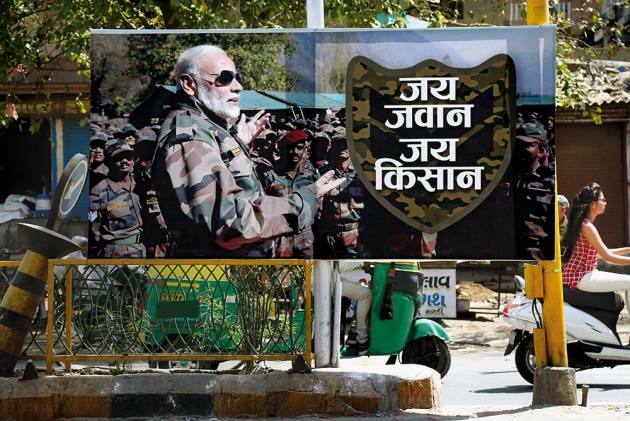 Those NaMo pictures, with him wearing aviator glasses and personalised fatigues, standing amidst soldiers, often with a rifle photoshopped onto them, fill the lanes and bylanes of Gujarat. His words are emblazoned across these banners, proclaiming him the vanquisher of the enemy and saviour of the country. There is a ready audience for these motifs in what was once, and still is to good measure, Modi’s Gujarat. Hiten Doshi, 21, will soon become one of India’s 130 million first-time voters (of whom 15 million are just 18-19). Doshi, a student at the National Institute of Design (NID) in Ahmedabad, says ­desperate times call for desperate measures. “The world is endangered by jehadi terrorism and so is India. We need a strong leader who can pay back in the same coin. India cannot be a doormat to terrorism. If someone slaps you, it’s foolish to turn the other cheek,” he says, walking down the Sabarmati riverfront, now a popular walkway and garden in the heart of the city. And then, barely a stone’s throw away from Sabarmati Ashram, where Mahatma Gandhi had spent a major part of his life fashioning his philosophy of peace into a mass politics, he ­reprises a maxim Gandhi had once ­extended and deployed against violence. “It’s time for an eye for an eye,” Doshi says. His blunt lack of irony testifies a truth: the Mahatma does not figure prominently in Gujarat’s consciousness anymore; his teachings are considered redundant. The country has moved on, says the NID student. The centre of gravity has now, in a sense, shifted to the Sabarmati riverfront: the place where Modi famously sat on a swing with Chinese President Xi Jinping, months after taking over as PM, holding out a promise of transformed diplomatic ties with the powerful neighbour. Doshi is confident that this time China will concede India’s demand at the UN Security Council to declare Jaish-e-Mohammed chief Masood Azhar a global terrorist. So has Doshi been influenced by the BJP campaign for first-time voters—‘Pehla vote Modi ko’? He just smiles in response. The question was redundant. Banners proclaim Modi as a ‘vanquisher of the enemy’. These motifs have a ready audience here, but Gujarat also has a pragmatic streak. This prototype does not fill Gujarat, of course. The state has also seen a fair bit of public turmoil and impatience among the youth after over two straight decades of BJP rule—in late 2017, the party survived a scare in the face of a Patel agitation and a resurgent Congress. Suruchi Shah, who too studies at NID, typifies that old Gujarati trait of pragmatism: she would rather have a steady job and peace at the borders. “Of course, the country needs to be protected, but I don’t think a war is going to help. It is going to take the country back by years. My grandfather’s textile business had nearly collapsed during the 1971 war,” she says. According to her, a government that works steadily, even if slowly, is better than a government that takes impulsive, ill-thought-through actions like demonetisation and the hasty GST implementation. Her family’s business in Surat suffered greatly on account of both, she lets on. Suruchi believes India’s women—who account for 43 crore voters—are more likely to vote on relatively down-to-earth and realistic issues. In Gujarat too, the ratio is catching up—2.1 crore women out of a total 4.3 crore—even if voting preferences cannot be always ­easily split in gender terms. Besides being Modi’s original karmabhoomi, and the first Hindutva laboratory, Gujarat is a microcosm of the entire country in terms of the themes that will dominate the Lok Sabha elections. No wonder, even the Congress chose the state to hold its CWC meeting, with Priyanka Gandhi Vadra addressing her first public rally after taking over as party general secretary. Hardik Patel—who spearheaded the Patidar agitation from 2015 on—also joined the Congress in the presence of Rahul Gandhi, Sonia Gandhi and Priyanka on March 12. The Patidars had been suffering the same att­rition in terms of life-chances as some dominant castes elsewhere, making the former anti-reservationists demand quotas in jobs and education. Hardik, 25, who had caught and forcibly vocalised that spirit then, is now not hiding his ambition to go beyond social activism. “It is difficult for caste-based movements to survive. Hardik probably realised it,” social scientist Ghanshyam Shah tells Outlook. But what of the Patidars? Shah says the anger has cooled. After first being stunned into immobility by the public rage, the State responded: the then Anandiben Patel regime extended benefits to the community, including a 10 per cent quota for non-reserved categories on the basis of their annual income. “This was rejected by the Gujarat High Court, but the Centre has now appro­ved it,” points out Shah. The richer segments in the community responded too. The Patidars, who accounts for 12.3 per cent of Gujarat’s population, are not a homogeneous lot, and range from farmers to businessmen and upper-­strata industrialists. At the Global Pati­dar Business Summit in Gandhinagar last year, Shah recalls, businessmen from the community pledged to provide jobs to 10 lakh Patidar youths by 2026 in the presence of CM Vijay Rupani and Congress leaders. If the BJP may find one segment difficult to placate, it’s the adivasis—8.6 per cent of Gujarat’s population. They are seething: their “jeevan dori” (lifeline), the Narmada, is being turned into a “gala dori” (noose), they say. The colossal statue of Sardar Patel stands as if surveying the dry patches of the river: from his vantage point at Sadhu Bet, he can surely see the 72 villages that make up the underbelly of discontent. The adivasis here are up in arms against the Modi government. “If Sardar Patel could see the mass des­truction of natural resources and inj­ustice done to us, he would cry. When we raise our issues, we are persecuted by the police. Why are you not ready to listen to our plight?” the headmen of affected villages asked Modi in an open letter last October, just before the Statue of Unity inauguration. Medha Patkar, founder of Narmada Bachao Andolan, tells Outlook that the government has been lying about the Statue of Unity project. “They said there would be no tourism related to it, but now they are talking about building 33 state bhavans there. Nobody from the government comes and talks to the villagers. The new government in Madhya Pradesh is at least having dialogues with us. They have a Narmada Valley minister too,” she says. Bharatmala, a flagship highway project Modi launched in October 2017, is also witnessing angry protests by adivasis and other farmers from Dang to Ambaji—a belt swathing from south to north-eastern Gujarat. Land was to be acquired from 63 (mostly adivasi) villages, spanning four Lok Sabha seats, for a 93-km road ­connecting Surat with Ahmednagar in Maharashtra. With elections around the corner, the project has been suspended as of now. Juhapura, home to half of Ahmedabad’s Muslims, is neglected. The adivasis are no longer the isolated lot of popular imagination. Each village has a WhatsApp group on which they share news and videos. “We know what is happening and we are waiting for elections to show our anger,” says Vasava. Nareshbhai Tadvi of Kevadiya village, near the statue, also cautions the Congress: anger against the BJP won’t automatically benefit them, he says. “We won’t vote BJP for sure. We may consider Congress only if it ­supports us. Otherwise, we will boycott the elections,” he says. Mehta doesn’t fail to mention that the Supreme Court acquitted all the six Akshardham accused in 2014. But electioneering is mostly gamesmanship. The Election Commission may have now asked parties to desist from displaying pictures of defence personnel in their campaign, but the terror/airstrike theme keeps getting played out in the speeches of Modi and other BJP leaders. “We are not going to let it die down,” admits a party spokesperson. This is Gujarat, after all.